Image courtesy of the Historical Society of Greenfield (Massachusetts). Thanks to Ed Gregory for this photo reproduction. When researching the history of the discovery of the dinosaur tracks, I first came across the name of Edward Hitchcock. Pastor, professor, college president, he was a prolific writer who seems never to have thrown anything away. Hitchcock’s life is well documented. James Deane’s name came up, too, because he and Hitchcock had an argument over who should have credit for priority in the discovery of the footprints. priority of discovery of the tracks. Whatever papers Deane left behind have disappeared, but we know of him because this dispute was well covered in the press, and when he died, his friends wrote in his defense. He wrote several papers and a large illustrated book about the fossil footmarks, and as a physician wrote numerous medical papers. The figure of Dexter Marsh, however, hovered elusively in the background. It wasn’t until I moved to western Massachusetts that I found a little more information at the town library and the Amherst College archives. (I remember a good friend, college educated, who asked, “Why don’t you just Google him?”) While a few records do exist, Marsh wrote little, so we barely hear his voice beyond his carefully kept records of income and expenses (which, if anyone is so inclined, would make a fantastic project along the lines of Laurel Thatcher Ulrich’s elucidation of the midwife Martha Ballard). He was literate but largely unschooled because he came from a family too poor to send him there. Seemingly humble, he achieved a brief fame and very modest fortune because he noticed what appeared to be the footprints of a bird in a slab of stone he was laying for sidewalk on Bank Row. Born in 1806 in Montague, Marsh moved to Greenfield in the early 1830s and built a little house on Clay Hill, now Bank Row, near today’s Olive Street. He married and started a family. He gained a reputation for industriousness, honesty, and conscientiousness. He was the handyman of choice for the town gentry: Russells, Alvords, Clapps all hired him for repair work to their homes and help with their gardens and animals. 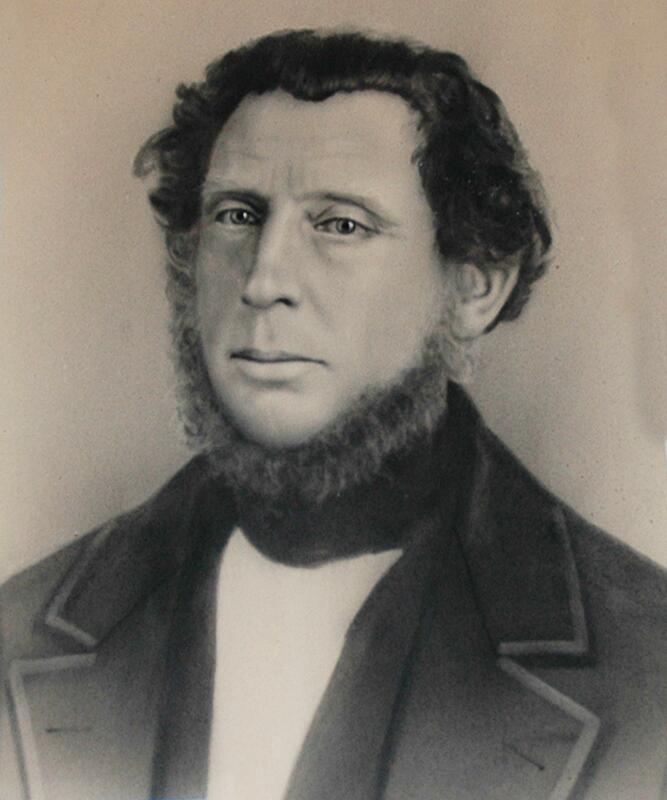 He was part-time sexton at the Second Congregational Church and janitor at Town Hall. It was while working for Town Hall in late winter of 1835 that he noticed the “turkey tracks.” Although deeply religious, Marsh apparently agreed with his neighbor James Deane that scientists, not theologians, should be told about these odd marks. As we know now, they were later identified as the tracks of dinosaurs, but the word dinosaur had not even been coined yet, so scientific opinion agreed with Marsh and Deane that the prints had been left by amazingly large extinct birds. Imagine flat stone slabs, the kind that split into sheets at the well-aimed whack of a pickaxe; that is, the kind of rocks used in sidewalks. 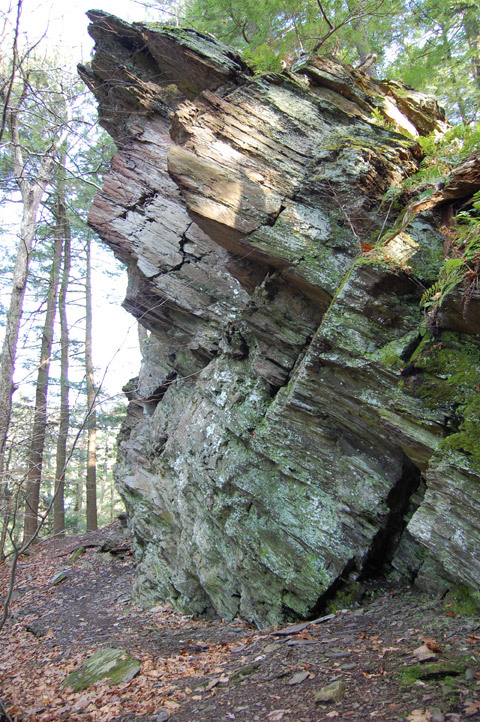 If you place your pick and hit it just right, the layers pry open easily, and you can pull apart the freshly cut slab to reveal two surfaces that haven’t seen the light of day in eons, with the shadow of shapes pressed into the rock. In the case we are imagining here, they look like the imprints of a bird’s feet, three toes and a sort of heel, right there in the stone, concave on one face and raised on the other. You are looking at a fossil, the remnant of something that was once alive, although rather than a bone, this is a trace that a creature left behind. Surprised and pleased with your good luck, and maybe with yourself, you might immediately set about looking for more, with a feeling, half delicious, half spooky, that the past has just reached out and tapped you on the shoulder. If you can imagine these things, you may have an inkling of how Dexter Marsh felt, but probably just a washed-out version. He may have been more spooked, or more baffled, or actually even more interested than you because he didn’t have a ready-made answer to the questions the footmarks raised in his mind. In Marsh’s time, some still believed that fossils’ uncanny resemblance to living creatures was an illusion. Maybe they were God’s little joke or, less light-heartedly, He was testing one’s faith: if you thought that fossils signified anything more—animals that have gone extinct, for example, like those mastodons that Thomas Jefferson had so admired—your faith was weak. The new science of geology was getting its bearings, and Dexter Marsh could have read about the amazing ideas coming out of geology in his local newspaper, where articles by Edward Hitchcock sometimes appeared. Even so, no one had imagined what we see in museums, on cereal boxes, toy stores, and just about everywhere in pop culture today. It must have rocked his world, no pun intended. 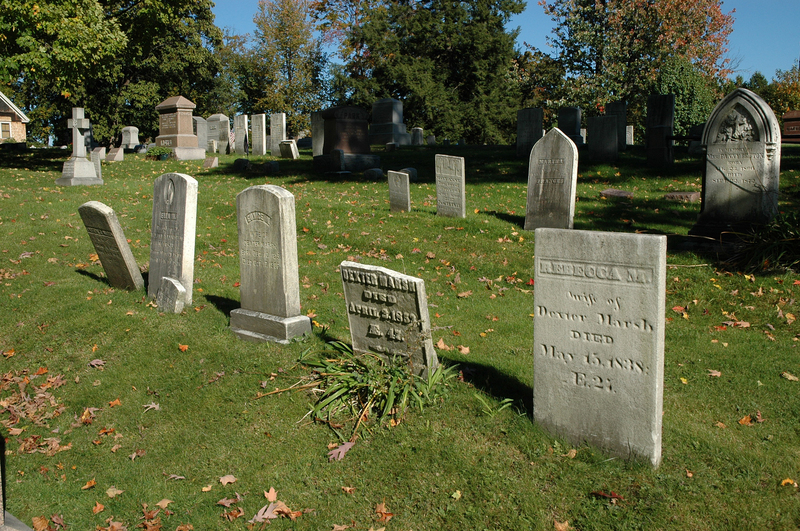 Marsh’s first wife, Rebecca Slate, of Northfield, died in 1837, leaving him with two young children after only three years of marriage. In 1839 he married Eunice Everett, of Halifax, Vermont, and had three more children. He continued manual labor, but his fortunes improved. He could sometimes hire others to work for him, often church brethren, so he could collect footprints. He donated many to museums, perhaps sold a few. After caring for family, he spent his extra money on geology books, religious publications, and abolitionist literature. He built a “cabinet” (museum) onto his house and opened it to the public. The guest book still survives, preserving the signatures of over 3,000 visitors: neighbors, the wealthy families he’d worked for, well-known college professors, even foreigners. He was elected an honorary member to the Boston Society of Natural History (later the Museum of Science), the American Association for the Advancement of Science, and the Academy of Natural Sciences in Philadelphia.There were other collectors of fossil footprints—Deane and Hitchcock among them—but Marsh’s collection was acknowledged as the largest and finest. While Deane and Hitchcock argued publicly over credit for the discovery, Marsh never entered the fray, although one of his sons later said that his father felt he had not received the credit due him. 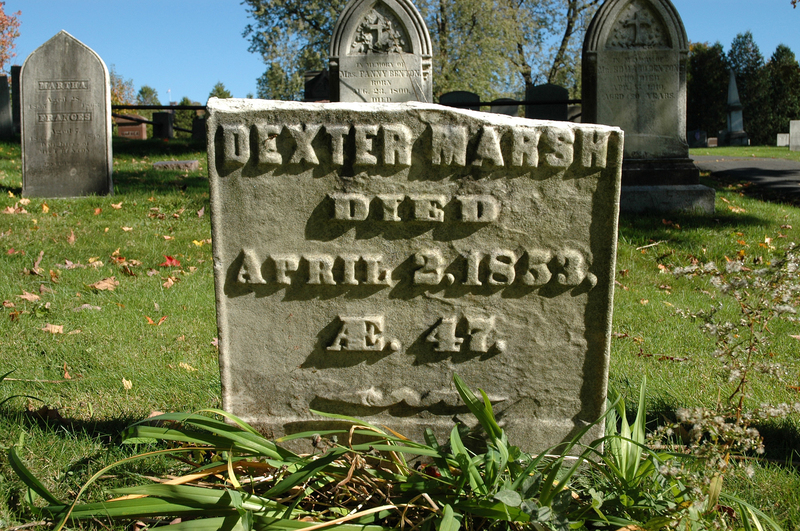 Marsh was only 47 years old when he died on April 2, 1853, leaving Eunice with five children, the youngest less than two months old. His illness came on suddenly and took him in a matter of weeks. This unschooled man left a library of about 90 volumes, none of it easy reading: several geology books by Hitchcock; Lyell’s Elements of Geology; Dana’s Manual of Mineralogy; Brooks’ Elements of Ornithology; 17 volumes on the Natural History of New York; issues of the Emancipator, and more. James Deane assessed the value of his collection of fossil tracks, which were sold at auction. Marsh had wanted the collection to stay together, but this did not happen. The largest buyers were Amherst College, the Boston Society of Natural History, and Yale. The proceeds allowed his family not great wealth, but some security. One of his sons went to Harvard and became a mining engineer in Colorado; the other moved to Nebraska, possibly after also attending college. The daughters seem not to have married. At least one died young. A year after her husband died, Eunice (who lived into her nineties) noted in her diary that she “set a weeping willow on Dexter’s grave and some other plants, hope they will live and flourish.” No willow shades the grave now in the Federal Street Cemetery, where Dexter lies between Eunice and Rebecca and daughter Ella is nearby, but there are a few flowers. A fitting tribute would be to fix his broken gravestone and maybe see about another willow. Posted in History, Science, UncategorizedTagged Amherst College, Connecticut River Valley, dinosaur footprints, Edward Hitchcock, fossils, history of geology, history of paleontology, history of science, local history research, Montague MA, natural history, natural history museums, Yale UniversityBookmark the permalink.